Spring might not have officially "sprung" everywhere, but there's no doubt the trees and flowers will start budding and blooming soon. How do you make a little piece of spring last longer? One way is to collect your favorite leaves and flowers and preserve them. (above) A collection of pressed flowers from the garden of My Petal Press ($7). To get you started, The Dainty Squid has some great plant pressing tips. You may have done this process in grade school, but it's definitely not just child's play. Once your plants are properly pressed, you'll need somewhere to keep them. If you're the type of person who likes systematic categorization, this herbarium folder by ARMINHO ($54) is a perfect way to archive spring. Of course, you don't need to keep the pressed flowers in a notebook or herbarium. There are numerous ways you can put them on display year-round. Here one idea from Sofia Rose Vintage ($26). And another crafty idea in the form of a light switch plate by My Petal Press ($11). With a little bit of help from some resin, pressed flowers can also make gorgeous wearable items, like this Queen Anne's Lace necklace by Lowe Lowe Jewelry ($26). Or, if you're feeling particularly ambitious, you can try your hand at pressed flower art. This amazing, intricate work is by Irina's Art by Nature ($150). Yes, those are all real pressed plants! If you're not a plant-pressing pro yet, you can also purchase prints like this one by Day Three Creations ($10) for your home. Happy pressing! At camp in middle school, each of the cabins were named after trees found in Ohio, and my cabin was birch. I've since had a special affinity for the whitish, gray tree with paper-thin bark, and it seems I'm not the only one. Here are some birch-inspired housewares and jewelry currently for sale on Etsy. For more, check out this treasury list. (above) Birch tree bark throw pillow cover by Brooke Ryan Photo ($38). Birch branch hooks by Woods of Narnia ($10 each). Birch bark paper straws by Kiwi Tini Creations (25 for $4.25). Birch bark cuff by Bettula ($35). 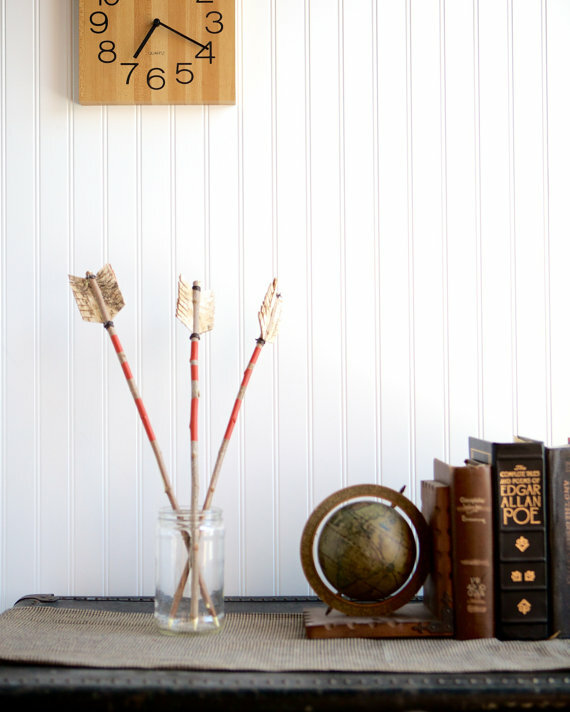 Decorative birch arrows by Northwest Midwest ($35). Birch bark bunting by F Collective ($18). 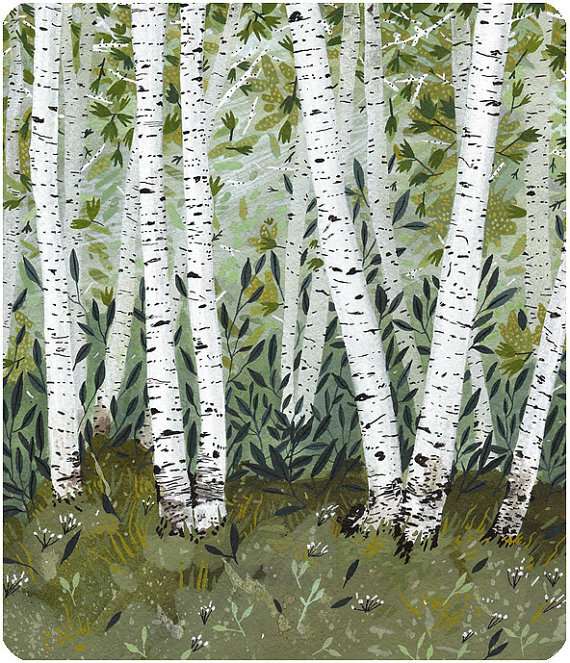 Birch grove digital print by Becca Stadtlander ($30). Chicory is as versatile as a foraged plant can get. You can use just about every part of it: the fibrous leaves, the hearty root, and even the dandelion-like flower. Since it was first cultivated in ancient Egypt—and, by the way, also in ancient Greece and Rome—this plant has been developed for many different uses. You'll find it in a variety of sizes and colors, and it is known by several different names: radicchio, sugarloaf, and Belgian endive, to name a few. Although chicory is mostly consider a weed in the United States, the plant's root is the not-so-secret ingredient in the coffee brewed at Café Du Monde in New Orleans. As the story goes, the endive was used to stretch out meager supplies when coffee was scarce during the French civil war. The French brought it to Louisiana, and today, you can still order up a cup of the coffee/chicory mix with the cafe's world-famous beignets. Warning: Only consume plants you can positively identify and know are safe to eat. Top photo by joeldinda, Flickr. All recipe images are copyright their original owner. Sources: Hungry Native, Temperate Climate Permaculture, and Wikipedia.